Since we opened for business in 1980, Dusty’s Lock & Key, LLC has been a premier locksmith service in Enid, OK. We are proud to be a successful, locally owned and operated small business with over 35 years of combined experience. 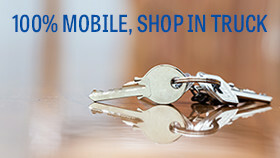 For over 35 years now, countless customers have turned to Dusty’s Lock & Key, LLC when they need an honest, dependable and reasonably priced locksmith in Garfield County, OK. We are fully bonded, insured and certified under both the Oklahoma Master Locksmith Association and Associated Locksmiths of America, meaning you can count on us to successfully complete any job you throw our way. We also provide free consultations to anyone who calls, and are happy to serve customers all over Northwestern Oklahoma. We have helped thousands of people over the last three and a half decades, and we look forward to helping you as well. We are a locally owned and operated small business in Enid, OK.
Our services are available to residential, commercial and auto customers. We are certified by both the Oklahoma Master Locksmith Association and Associated Locksmiths of America. Our prices are always fair and competitive. Please get in touch with Dusty’s Lock & Key, LLC today at 580-541-1457 for a free consultation.